A rejuvenating practice for the beginning of spring. Laura will guide you through an accessible, gentle yoga sequence of movement and breath-work that will mobilize the joints, activate the muscles, and balance the nervous system. Followed by a guided, yoga nidra meditation, known as “yogic sleep”, which invites one into a place of mindful awareness, intention, and deep relaxation. This class is open to everyone and can be practiced on a yoga mat or in a chair. No prior yoga or meditation experience needed. By now almost everyone has heard of CBD and how amazing it is. But what is it, and how do you know if it's right for you? Join Herbalist Paula Billig to find out what the buzz words actually mean, what it does and doesn't do for you, what your ECS is, how to choose best forms and amounts for you, and answers to your other CBD questions. Paula does not sell CBD products, she is an herbal wellness educator for her clients and the public, so this presentation is designed to arm you with knowledge and information as you navigate the broad spectrum of CBD products for sale in the world. We hear it all the time: sitting is bad for our health. And we feel it too: low back pain, tight hips and shoulders, and sore necks. Learn about the muscles that are affected by sitting and how to release and strengthen those same muscles from where you sit. This workshop includes sitting and standing postures and relaxation techniques that can be done from a chair or workstation. Chair Yoga is a practice for all ages. Acupuncturist Heather Mancini and yoga teacher Megan Duffy will partner to offer you a yoga with acupuncture class here at GCA. This 75-minute class includes 45 minutes of gentle and calming yoga poses seated and standing, with the remaining 30 minutes for acupuncture on your mat in a final resting savasana pose. Points for blood flow, calming, balance and releasing tension. Qi gong can be practiced and adopted at any age. It is a system of coordinated body posture and movement, breathing, and meditation used for the purposes of health and martial arts training. Qigong is considered a form of exercise in Asia and can be a powerful booster for your health and well-being. Qigong has endured the test of time and is accessible for all ages. Grab your parent, spouse, partner, coworker friend or neighbor and see what it’s all about! Join Naturopathic Doctor and Acupuncturist, Mikeal Brucker and Acupuncturist, Margaret Haff for a 75-minute combined acupuncture with qi gong special event! This workshop will be 75-minutes, and will start with acupuncture in a lying position on your yoga mat to get you relaxed and grounded followed by 40 minutes of guided Qigong including a full sequence that can be practiced at home. The mission of TODAY is a Good Day is to provide personal and financial support to families of premature babies during their time in the Neonatal Intensive Care Unit (NICU). Dinner & SILENT AUCTION: $40/pp. Acupuncturist Margaret Haff and yoga teacher Megan Duffy will partner to offer you a yoga with acupuncture class here at GCA. This 75-minute class includes 45 minutes of gentle and calming yoga poses seated and standing, with the remaining 30 minutes for acupuncture on your mat in a final resting savasana pose. Points for blood flow, calming, balance and releasing tension. $25 pre-registration required. POSTPONED: Due to inclement weather, the Downtown Glenside Food Truck Festival will be held on Thursday, October 18. Join Arcadia University, Downtown Glenside Community Partnership, and Cheltenham Township for great food, music, and art at the annual Downtown Glenside Food Truck Festival. This year’s festivities coincide with the inauguration of Arcadia’s 22nd president, Dr. Ajay Nair. All members of the community are invited to join in a parade down Easton Road, attend the Glenside Station mural lighting (6:45 p.m.) led by Arcadia artists, and celebrate a new chapter in the University’s history alongside students, faculty, and staff. Stop by the Keswick Village Fall Festival for free mini acu treatments! 1:30-5pm right out front of our office. Having trouble sleeping? Can’t relax your body or quiet your mind? Come to a FREE herbal workshop with Herbalist Paula Billig! Learn about favorite herbs that help us fall asleep and stay asleep, try some sniff- and taste-testing, and leave with personalized sleepy herb information. The Glenside Fire Company Stop, Drop & Run 5K (5K Run or 1.5 Mile Run/Walk) supports the all-volunteer Glenside Fire Company #1. Both the 5K run and the 1.5 mile walk/run will start and finish at the Glenside Fire Company Firehouse at 210 W. Glenside Avenue in Glenside. This is conveniently located across the street from the Glenside Train Station for anyone using public transportation. The run will take two loops through the scenic streets of Glenside. A few rolling hills throughout the course will provide just enough of a challenge to satisfy any level of runner. The 1.5 mile walk/run will follow the same course, but only complete one loop. 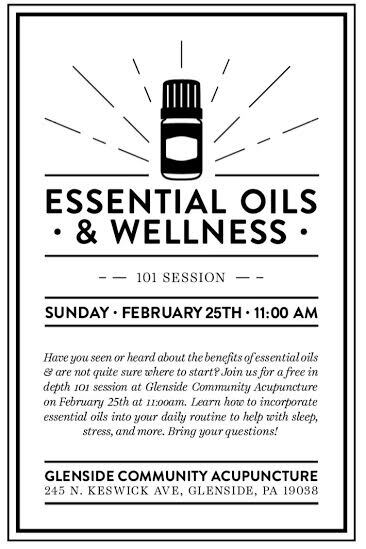 We had so much fun the first time, we wanted to bring this Oils class to you again!